After an incident regarding a crossing guard and a bottle of Martini & Rossi (and his friends), 17-year-old worrier Ben Fletcher must develop his sense of social alignment, take up a hobby, and do some community service to avoid any further probation. He takes a knitting class (it was that or his father's mechanic class) with the impression that it's taught by the hot teacher all the boys like. Turns out, it's not. Perfect. Regardless, he sticks with it and comes to discover he's a natural knitter, maybe even great. It also helps ease his anxiety and worrying. The only challenge now is to keep it hidden from his friends, his crush, and his soccer-obsessed father. What a tangled web Ben has weaved . . . or knitted. 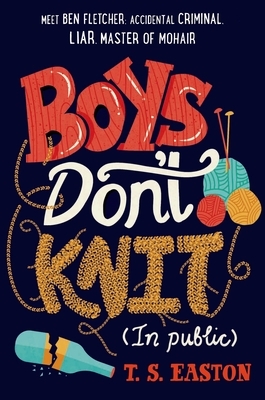 Boys Don't Knit (In Public) by T. S. Easton is a fun, funny young adult novel about a teen boy. T. S. Easton is an experienced author of fiction for all ages in the UK. He lives in Surrey with his wife and three children. Boys Don't Knit received a Carnegie Medal nomination (2015).